name mentioned in an anti-semitic tract on the internet. Ubuntu/Dapper on my corporate hp nc6000 laptop. Who doesn't love that flash video? still confuses grub. There is a simple work around. team. I took a couple crappy photos. down when I started running out of web space. Trevor had an excellent vault this morning and got him second place in that event. 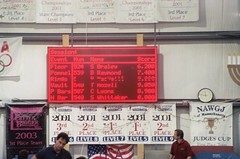 In the All Around he placed 9th in Level 5 (Boys 10 & 11).